Give them the TLC that plays up their delicate texture and doesn't hide their interesting flavors. You've worked hard to grow them. Now give them special treatment. Lettuces from the garden shouldn't be drowned in heavy ranch or other dressings. • Add something onion-y. If there's not already garlic in the dressing, add some freshly snipped chives from the garden, or chopped up green onion and tops, or slivers of red onion. • Add a complementary veggie or two. Keep it simple, though. The star should be the lettuces! I love radishes, green peppers, cucumbers, or cherry tomatoes. • Add a fresh herb. If you have some, add a handful of chopped parsley, tarragon, or cilantro (if you're doing a lime-based vinaigrette). • Helpful hint: Start serving other types of salads on top of a bed of garden lettuce. Spread several big handfuls of lettuce on a platter and top with a mound of three-bean salad, potato salad, or cucumber salads. Fancy, pretty, healthy, and yummy! Go easy on the dressing and toss really well—and serve! Put in a jar and shake vigorously until blended. • I like white balsamic vinegar a lot. Mild flavor and doesn't discolor the leaves like regular balsamic vinegar. But experiment with vinegars. Rice vinegar is also great! • Add 1 teaspoon minced garlic for more flavor. • Add a dash tabasco for a little kick. • Add a pinch of sugar, one teaspoon or so of orange marmalade, or a little raspberry jam for some sweet—great with more bitter greens. • Add a teaspoon of mustard. This adds flavor and acts as an emulsifier, which gives the dressing more body and blends it better. 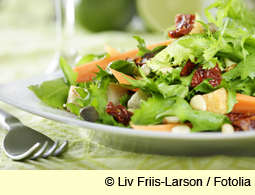 • I love adding lemon juice for a truly fresh-tasting spring salad. • Try lime juice for a salad that's great with Mexican and Asian foods.